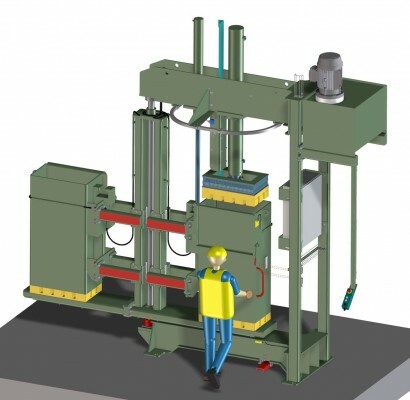 This hydraulic baling press VVH40C-DSK is designed especially for baling small bales of used clothing, with dimensions that fit perfectly in maritime containers. It is a vertical hydraulic swivel press with two boxes, a filling and a pressing box, each equipped with a filling door. While one operator fills a new load in the filling box, a second operator finishes the previous bale in the pressing box. This way, a capacity of 15 to 20 bales/hour can be achieved.